Take home a dangerous woman this Christmas. 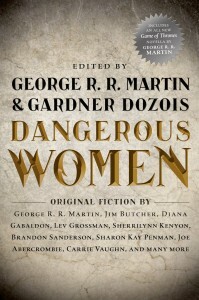 DANGEROUS WOMEN, the latest big cross-genre anthology from Gardner Dozois and yours truly, has been scheduled for a December 3 release in hardcover, according to Amazon. (I assume that is correct. The date has not actually been confirmed for me by anyone at the publisher, but presumably 'twas Tor who gave Amazon their date. Sometimes, alas, the author is the last to know). (I know, I know, some of you will not like the cover. Honestly, I am not a huge fan of the all-typographic approach myself, but it seems to be the lot in life for writers who reach a certain level of success, the thought being that the writer's name will sell more copies than any artwork, no matter how splendid. And DANGEROUS WOMEN contains stories by a LOT of brilliant famous award-winning bestselling writers, ergo the desire to trumpet their names. All understandable. Being an old fanboy at heart, however, I love great SF and fantasy art, and would have preferred to depict some actual dangerous women on the cover... but this one, I must concede, will probably sell better). Your Grace, the dragons are coming. Re the cover, I can also see that in compilations with quite the variation in theme/story it must be quite difficult to make something that represents everything inside. Good point. I was just wondering what exactly they might have done for a cover instead of what they chose to do, but your statement says it all. This is wonderful news--I've just pre-ordered! On a slightly related note, when I have the chance I grab my copy of Dreamsongs and turn to one of your stories I haven't read yet. I hadn't had the chance to do so in forever but last night finally found an opportunity to dig in again and went for Sandkings. It was already late and I wasn't expecting to get in but maybe a few pages before snoozing off. Needless to say I was afforded no such luck. My eyes didn't close till well after the last word was read, and even after they did my mind has lingered in that dark beautiful story ever since. No thanks is big enough for sharing your worlds with us. > Needless to say I was afforded no such luck. My eyes didn't close till well after the last word was read, and even after they did my mind has lingered in that dark beautiful story ever since. No thanks is big enough for sharing your worlds with us. I have to say: even as a fan, that made me very happy. So many people are vitriolic it makes me avoid the fandom, but you read stuff like this - someone who doesn't stomp their feet and demand a book NOW - and who understands that art takes time to craft, that we should appreciate the work, and it makes you love reading all over again. Thank you. I like to think that GRRM was happy with your comment, too. Sand Kings is my favorite Martin short story with the possible exception of the Ice Dragon. Kings is so scary and twisted and complex. I reread it at least once a year. Wish someone would make a horror flick based on it. You mean other than the 1995 Outer Limits adaptation? Yes, I do not consider the 95 Outer Limits adaption a full scale 90 minute horror flick (you know, like what is played at the movies). And that is what Sandkings needs to do it justice (in my opinion of course). The Outer Limits thing was great and all, but it could be way more. Looks great George! i know you've been busy on this one for a while so I'm sure you're glad to witness its evolution. Looking forward to the first Dunk and Egg collection, the story found here, The World of Ice and Fire, as well as 'the GRRM-arillion', and any subsequent volumes. Again, won't hold you back from duties / relaxing, just wanted to thank you for taking the time to update us. Closer to the fall, I will send you a message in regards to my short story. A final PS: those looking to find the season 3 soundtrack of Game of Thrones will be pleased to know it will be through itunes June 4, and on CD for us dinosaurs on July 9, via Water Tower instead of Varese Sarabande. It's only bad when the author's name becomes larger than the title. I work at a library, and I quickly found whose works have less substance... especially when a new best seller is on the shelf within mere months of the last! Please, Mr. Martin-- take all the time you need. Ooh, sounds interesting. And Sharon Kay Penman! Can definitely go for that. And the Holland story about one of my absolute women in history, Eleanor of Aquitaine? OH YEAH. And the Fake History from D of Dragons? I think I just had a fangasm! Hi George, how's progress coming on the Poul Anderson tribute story? I'm highly looking forward to that collection. Brilliant cant wait for it!! Any eta on Dunk and Egg? Just curious. So, how many monkeys are left by now? Congrats! Of the stories in existing settings -- are they wholly standalone or do they work better if the reader is already familiar with the setting? I may not be finished reading the Old Mars collection by the time DW appears, but I'm not complaining. I love these anthologies! Oh, I'm not complaining. I'm gonna pre-order it now. Is this a Dunk and Egg story? Is the "She-Wolves of Winterfell" being saved for another collection? Or has it been scrapped? Yay for Sharon Kay Penman!!! Pre-ordering NOW!!! Only related in terms of dangerous women, but you might enjoy checking out the webcomic "Strong Female Protagonist". The writer and artist *are* friends of mine, but don't hold that against them! And, the writer is also the son of Elaine Lee, write of STARSTRUCK. I hope you are familiar with that work. Anyway, I'm super excited about this anthology. As much as I enjoy the artwork, sometimes it's nice to build the character completely in your own mind, based solely on the words.